Tell Brak is one of the world’s earliest cities, which reached urban scale and complexity by the early 4th millennium BC and retained political importance and economic power through most of the 3rd millennium BC. Tell Brak is situated in the Upper Khabur plain of northeastern Syria. It is one of the largest ancient tells in northern Mesopotamia, over 40 m high, 800 x 600 m in area, with an extensive Outer Town including a ‘corona’ of smaller tells surrounding the main tell. 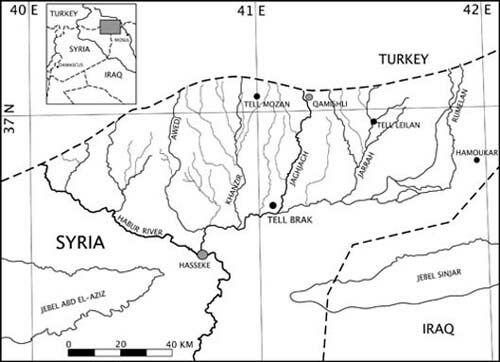 As a ‘gateway city’, Tell Brak controlled one of the major roads between Assyria to the east and the northern Levant and Mediterranean to the west, as well as north-south routes connecting the Euphrates Valley to the metal, timber and stone resources of Anatolia. The main mound of Tell Brak was occupied from at least 6000 BC to the late 2nd millennium BC, or the end of the Late Bronze Age (Middle Assyrian Period). Settlement of ‘Ubaid to early Islamic date is also attested in the outer town. 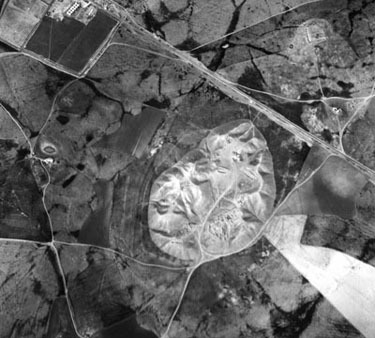 Tell Brak provides one of the first examples of archaeology aided by aerial photography, the work of Fr. Antoine Poidebard in the 1920s. The main tell was first excavated in 1937-38 by Max Mallowan, husband of Agatha Christie. She joined Max on many of his excavations in Iraq and Syria, and her evocative description of work at Brak is included in Come Tell Me How You Lived. The modern Tell Brak Project was established by David Oates in 1976, in order to explore the then little-known 3rd millennium BC occupation of Northern Mesopotamia. Since then, the project has comprised research themes as diverse as ancient climate change, colonialism, urbanism, and early warfare. We wish particularly to thank colleagues in the Directorate-General of Antiquities and Museums in Damascus and the local Department of Antiquities in Hasseke, without whose assistance and support research at Brak would not be possible. We would also like to thank the McDonald Institute for Archaeological Research, which is the base of the project in the UK. © Tell Brak Project. This site was designed by Christina Bouthillier-Reade and was last updated November 2013. Text by Joan Oates and Augusta McMahon. Photographs by the Tell Brak Project unless otherwise stated. The aerial photograph is courtesy of Hartmut Kühne and Norbert Grundmann. Photographer N. Grundmann; pilot, Abbad Samman; co-pilot, H. Kühne. Copyright Shech Hamad Excavation 1984.